From royal and suppressed archives comes proof of the descending heritage of Jesus in the West. In Bloodline of the Holy Grail, Laurence Gardner casts penetrating new light on the Grail Code of Service and the venerated feminine element, abandoned by the Church in order to forge a male dominated society. This unique work offers revelatory insight concerning the descendant heirs of Jesus and his brother James. In documenting a hidden legacy of the Messiah, hitherto guarded facts are unveiled about characters such as Mary Magdalene and Joseph of Arimathea. Historical chroniclers, such as Hegesippus, Africanus and Eusebius, recorded how in AD 69 the Roman Emperor Vespasian decreed that all members of the Davidic line of Judah should be “ferreted out, so that no member of the royal house shall be left alive”. Subsequently, in AD 81, Emperor Domitian decreed more specifically that “All the heirs of Jesus must be hunted down and put to the sword”. 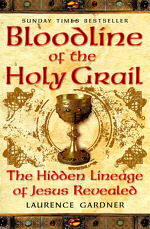 Bloodline of the Holy Grail follows the path of this persecution through the centuries. With all the charm and adventure of Arthurian romance, this worldwide bestseller has a cutting edge of political intrigue, and reveals one of the greatest historical conspiracies ever told. "Here is more than enough evidence about continual plots to suppress our Messianic heritage." "Committed Christians will find it casts fascinating light on the origins of their beliefs." "A controversial and uniquely comprehensive book of Messianic descent, compiled from the most intriguing histories ever written." "Packed with intrigue, this controversial book continues from where others in the genre have left off."